When I left Watsonville (pop. 52,000) in the fall of 2012 to attend Occidental College in Los Angeles, I expected to cry at the absence of family and friends. But I didn’t anticipate how much I would miss small restaurants that I had taken for granted back home, like the tiny Japanese spot on East Lake or the cowboy-themed diner near our local Target. I was in desperate need of an L.A. food spot that felt like home, so I made lists of places to check out on weekends, placing my faith in L.A. dining guides, Yelp, and Google searches. In the end, I didn’t need to look far. I don’t know what I’d do without The Oinkster on Colorado Boulevard, just a mile from Occidental and on a street with more places to visit than all of Watsonville. Near The Oinkster’s pointy roof stands a large sign, “Slow Fast Food.” Abiding by 60s burger joint traditions, the building has a red-and-white color scheme and is small in size, but there’s always somewhere for me to eat. So, after getting lost in a two-story bakery in Glendale (I still love you, Porto’s!) and struggling to find both parking and the entrance to an elusive organic restaurant in Pasadena, the size and simplicity of The Oinkster was refreshing. In reality, I used an app. Nowadays, there are about a million ways to stumble upon a restaurant, including an app entitled StumbleUpon. Even though The Oinkster is so close to Oxy, I needed The Oinkster’s Instagram to clue me in to the burger joint’s existence. Their bio on Instagram is “Happiness is a warm bun,” and their photographed specimens include not only burgers and milkshakes but also occasional celeb snapshots (like Marc Maron). I want to say that celebrity shout-outs made no impact on my decision to visit the gourmet burger stop, but that would be less than true. I was intrigued by the faint whiff of glamour like any other young out-of-towner who grew up romanticizing TV sets and movie stars. It’s possible I imagined casually bumping into Nick Offerman, but I can’t confirm or deny. One late night in November of my freshman year, I dragged a friend to The Oinkster for the first time. I did not run into anyone even semi-famous, but I did see my future English professor and about half a dozen hipster adults with their adorable (and fidgety) children in tow. Two milkshakes-of-the-month were ordered, and a single sip of the pumpkin pie milkshake suddenly made me feel like I was getting Thanksgiving dinner pumped into my veins through an IV. 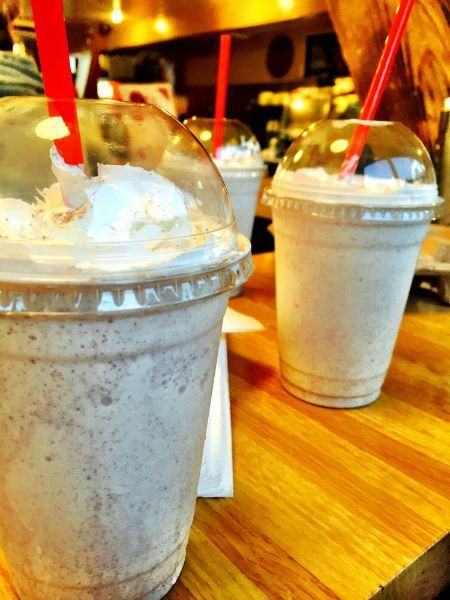 The milkshakes ($6) are pricey for a college kid, though not out of range like some of those fancy restaurants that appear on “Best of L.A.” lists. And these milkshakes of the month give you your money’s worth, whether you’re drinking the festive peppermint meow shake (a play on “peppermint bark,” it contains peppermint ice cream, pieces of candy cane, and chunks of white and dark chocolate) I gulped down in December, or the January banana walnut shake with peanut butter and bacon bits that shouldn’t have worked, but did. Unlike some of my favorite restaurants in Watsonville, no one knows me by name or stops by my table for a short chat. But I never mind those little details when I’m salivating over an Oinkster original shake that’s headed in my direction. I’ve become an Oinkster regular. Now I pop in at least once a month already knowing exactly what I want to order—usually a shake and often a veggie burger. This wouldn’t have been my order at a burger joint before The Oinkster. I used to swear I couldn’t do vegetarian diets, but then I sampled an Oinkster veggie burger on a whim when it was a burger-of-the-month, and now there’s no going back. Aren’t your college years for trying things you never thought you’d do? And on special occasions? I also head to The Oinkster. I took my parents there when they visited me at school, after warning them that the burgers were large and a mess to hold. We sat outside while I downed a horchata milkshake, filling them in on all the college stories I had been saving for their visit. And when my friend turned 21 and wanted to buy his first draft beer, well, where else would we go? The cashier joked around with him while ogling his I.D. We sat outside as he had his first legal drink and I eyed the passing traffic, nursing a bottle of addictive Boylan root beer. 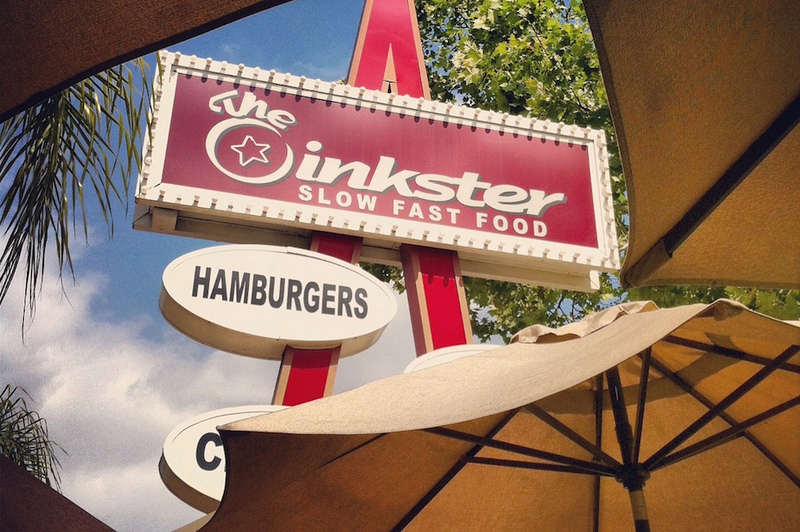 The Oinkster makes something as mundane as a burger run into a prized ritual. And rituals matter when you’re in a new place. Yes, it can be nice exploring a different edge of town every weekend, adventuring like someone on a city-based safari and captioning every dining Instagram with the hashtag #foodie. But there’s also something to be said for slowing down, and cultivating a particular comfort spot. How can I feel like a stranger to Los Angeles when there’s a place in Eagle Rock where I can order a favorite meal without having to glance at the menu? It’s a newcomer’s strategy: Take one tiny bite out of a huge city and chew it into something familiar. Dominique Resendez is a senior at Occidental College studying English and Media Arts, and a summer fellow at Zócalo Public Square. She wrote this for Thinking L.A., a partnership of UCLA and Zócalo Public Square. Primary editor: Joe Mathews. Secondary editor: Jia-Rui Cook. *Lead photo courtesy of calamity_hane. Interior photo courtesy of Stephanie D.